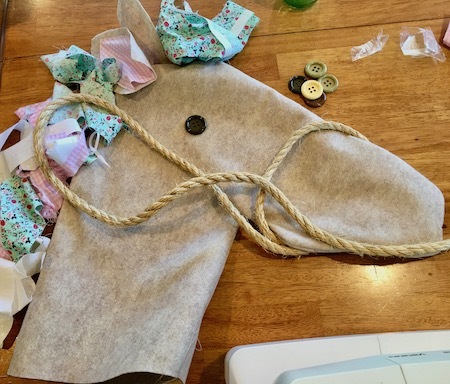 Hobby Horse DIY, A labor of love for the sweet little birthday girl! Details on the making of this hobby horse below. Check out our own "country party sign" made with a pallet, and for more homemade party decor check out "make party decorations"
Photo Booth Our hobby horse is the star of this country party photo booth. 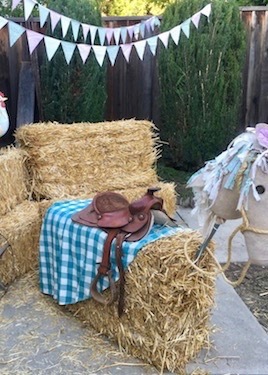 A few bales of hay, some borrowed items and a homemade hobby horse took this photo booth to a whole new level. For more details see "Photo Booth DIY" coming soon. Fabric scraps for the mane. 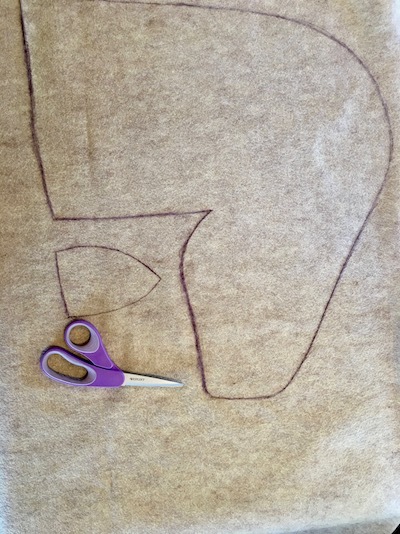 Pattern-Make one or use ours (below) Draw it out on butcher paper, muslin, newspaper, or whatever you have. Mop or Dowel-We used an old mop which had a clamp at the end, and really helped hold things in place. You may need to consider a clamp or glue of something to keep horse head from spinning. 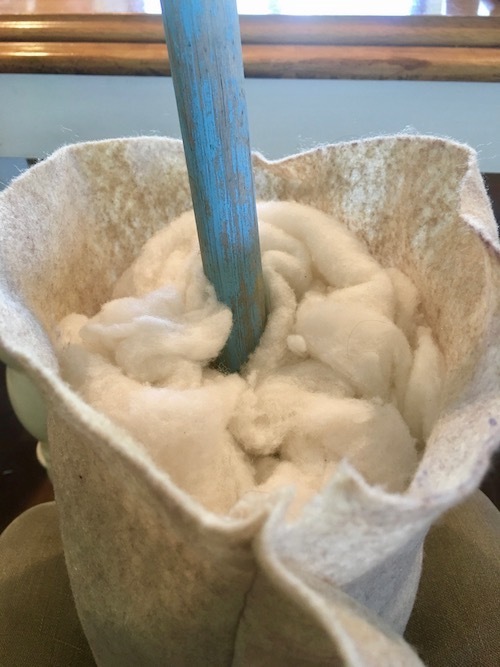 Stuffing/batting- Use whatever you have. We a combination of batting and stuffing from a pillow. Hobby horses can get pricey, but In this example we used found materials, so the cost was only $5 for the felt and the buttons, and we have a unique custom treasure! We used butcher paper, but anything big enough to draw the pattern will do. Newspaper is big enough. Just make sure the ink doesn't rub off onto the fabric. Look for a picture of a horses head that you like, and draw onto the paper. 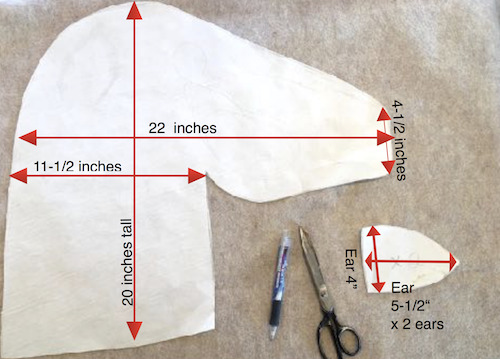 Use our pattern and dimensions as a base, if you like, or make one to your liking. This horse is extra large with a photo booth in mind. Next, with right sides together, double the fabric and trace. We folded our yard of felt in half. Any fabric will do, and it doesn't need to match. Each side could be a different fabric, or even a patchwork would be cute. With right sides together, cut out all the pieces (2 of each). 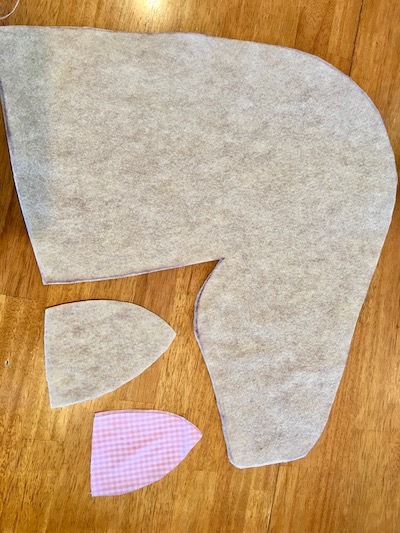 Cut out accent fabric for ear, smaller than the pattern. Ours is pink. Sew or glue accent fabric in one side of each ear, then with right sides together sew around the ears on 3 sides using a 1/4 inch seam allowance. Leave the flat side (bottom of ear) open for stuffing. When done, turn ear right side out and press. 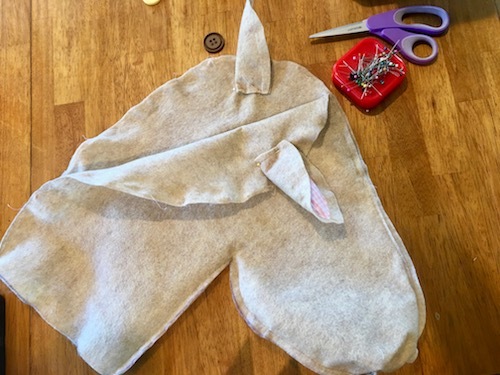 Sew around the horse head using 5/8th seam allowance, leaving the bottom (neck) open. 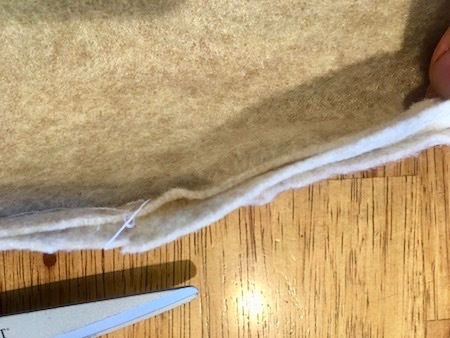 Trim excess fabric from seam seam and clip curves for easier shaping. Here's all of our pieces to this point. Now were ready to stuff. 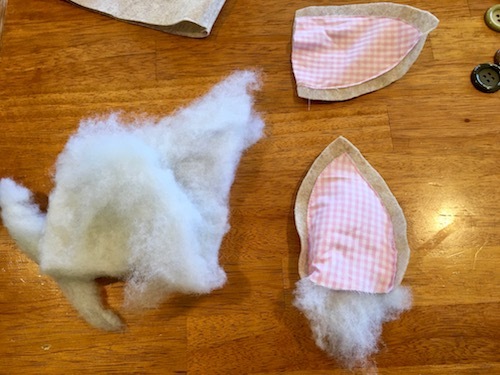 Ears - Use a little of the stuffing/ batting to stuff the ears. 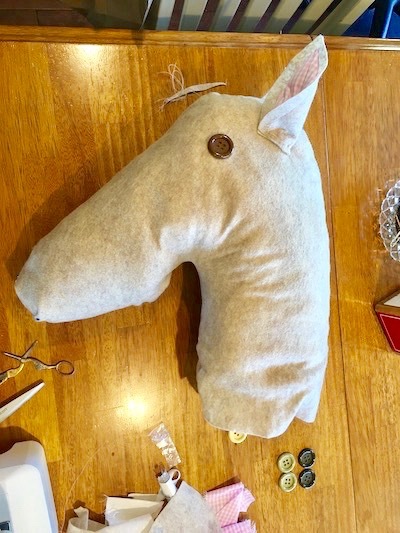 Ears & Mane - Using a seam ripper or small scissors, we opened the seam where the ears and mane would be placed. 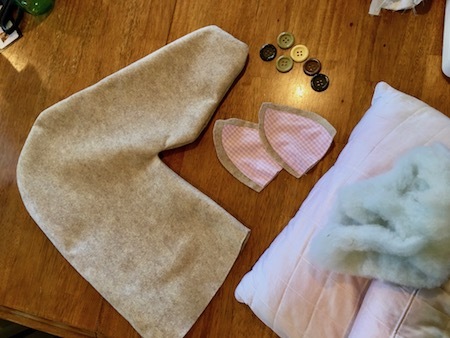 A wide strip of fabric for the mane is sewn between the layers, just like when you sew a trim into a pillow. When turned right side out, the fabric for the mane will be on the outside of the horses head with a nice neat seam. See notes at the bottom of the page on more options for installing the mane. Stuffing - We stuffed the horse head with the batting. Stuff the smallest parts of the head first (mouth and nose area). When satisfied, use a string or ribbon to close up the neck. Shaping - Manipulate the batting to shape the horses head to your liking. Should be looking something like this. Shreading the batting will help eliminate big lumps. In the photo below you can see the mane that was sewn in earlier matches the horses head (beigh felt ). We cut that in strips and used the strips to tie the other pieces of fabric into the mane until it was full. Another option s to sew each piece of the mane in individually. 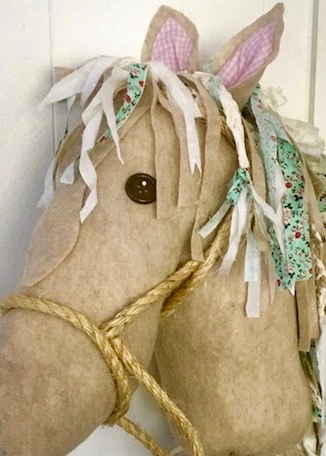 Either way, this hobby horse is adorable! Enjoy this hobby horse for years to come. Photo booth, play toy, childs room decor, and a family treasure made with love! That's theDIYeffect! Be sure to check out all the parts to this country party!